Everyone deserves to be heard, and everyone has a piece of the truth. Find ways to invite sharing from all, not just the loudest, most senior or most articulate. Actively draw out the wisdom of quieter or hesitant participants. American culture tends to value product over process and most people are in a perpetual hurry. Together these run roughshod over many quiet wise people to the point that they quit trying to be heard. Thus to the extent possible we want the structure of group processes to ensure that everyone be heard. Groups may say they value inclusivity, but unless they find a way to put that into action it becomes merely empty words. If the group has explicit operating values and one of these relates to including everyone's voices, it can help to remind the group of this value at the beginning of the session. Also some groups use Ground Rules to help them act in line with their values and to be effective, some of which may relate to this pattern (e.g., "No interrupting"). Particularly in general open discussion, there is a tendency for a few people to do much of the talking. It's often easier and more effective to find ways to encourage more expression from quieter people than to shut down the louder people (most of whom have good intention and don't realize their expression may be shutting others down); however, techniques for both kinds of intervention may be needed. This pattern takes different forms depending on whether the group is in a general discussion format vs. other formats. Alternate formats are under-used by most groups and can go a long way toward bringing in a wider variety of voices. These other formats often invoke other modalities, such as posting ideas up on a board, mind maps, art projects, multimedia and music contribution opportunities. But simply spending a portion of the time in small groups, or even quick pairings for people to share reactions to a presentation, can help shift the energy and get everyone involved. Going into pairs or triads early in a session may help forestall some of the unequal dynamics that otherwise arise in whole group discussion. asking "Would anyone who has not spoken yet like to say anything?" 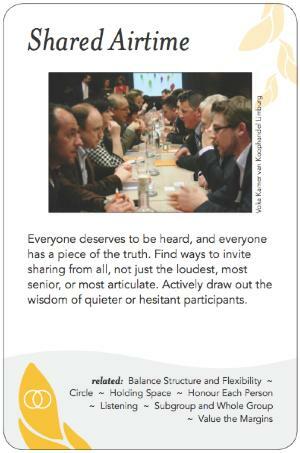 doing a Go-Round (or Round Robin) where each person is invited to contribute if they want to; this sometimes includes allocating a set amount of time per person where even if someone is not speaking yet, the group sits in silence to allow the space for new thoughts to emerge. Before beginning a Go-Round it is often helpful to have everyone sit in silence for a minute to think over what they might say; that increases the chances that people are actually listening while others are speaking, instead of rehearsing their own statements. If people know that everyone will get a turn, that can lower anxiety thus making it more likely that they'll bring their best thinking forward. The facilitator also needs to manage their own anxiety so that they don't talk more than the group needs. If one person is speaking too long, it may be necessary for someone else to step in with a short question, an offer to summarize what the person has said so far, or a simple "thank you." These occasions are a particular time when having a designated facilitator is helpful, so that someone in the room is explicitly empowered to support the participants in this way. Mirroring can be an especially effective intervention here, as often if someone is speaking too long or repeating it's because the point they are making has been insufficiently acknowledged. Or if a participant is struggling to articulate their point, someone else may be able to assist in getting it clear. The facilitator and/or other event leaders can do a lot to support hearing from everyone, but this pattern's full manifestation also depends on individuals' willingness to speak their truth to the group. Be careful not to punish people or make them feel bad for being enthusiastic contributors or having energy to contribute; people's energy is good, the key is to figure out how to include the energy and insights of less assertive participants and weave it all together. Paul Jacobs says, "As a facilitator (normally over-functioning) I want to move the action forward, I have to really work at slowing down and making time and space for everyone. I do best when I designate times (must be multiple) to slow down and make sure everyone is heard. As a participant others tend to chafe if I ask for time for the quiet ones unless this is in the ground rules, agreements, or values of the group." Meme: This pattern has the potential of moving a group from the Spiral Dynamics green meme of social action for others to yellow meme knowledge of self.